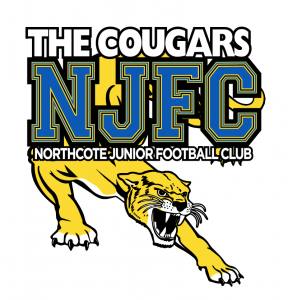 NFNL SEASON OPENING GAME NORTHCOTE PARK COUGARS VS BUNDOORA BULLS Friday 5th April - 7:10pm Get down to Bill Lawry Oval and support Northcote Park Cougars as their senior men take on Bundoora Bulls in the opening game of the 2019 NFNL season. Wear your Cougars Gear! This is a great chance to see the Cougar men’s side play a game under lights as most games are played on a Saturday afternoon during the season. Congratulations to the following girls who have progressed to the second stage of the Under 15 Girls Christina Papadimitriou Darcy Honey Kayla Papadimitriou Louisa Harper Lulu Beatty Rose Stewart As well as a BIG Congratulations to Sullivan Everett who has progressed to the second stage of the Under 15 Boys. Well done to all we are very proud of all your efforts and determination. Early Bird Registration Ending Soon Early Bird Discount: Up to 31stJanuary 2019 there is an early bird discount to registration fees. Early bird registration fees are $240 for first player/ $200 for second player within the family/ $65 for third player within the family, or $180/$150/$65 for holders of health care cards. From 1 February 2019 registration fees are $265 for first player/ $220 for second player within the family/ $75 for third player within the family, or $190/$160/$75 for holders of health care cards. Multiple kids? If you are registering more than one child from a family please use the registration link on the club website, rather than the link sent via email to each member, to ensure you receive the sibling discount. Excitingly Mel Story – Coach U14 Boys 2018 has accepted an invitation to coach with both the Carlton 2019 U15 Next Generation Academy and U15 Matthew Kreuzer Squads. It is a privilege and great opportunity for Mel and the boys to pursue a passion and desire to learn, lead and take their footy game to the next level. Well done to the players and our 'Cougars Team' that have assisted in our development thus far. We look forward to the developmental flow on effects within the team for 2019 in U15 Boys. Six boys (26%) from the team the U14 2018 NJFC Team have been successful in receiving invitations to further their football development through training with the following squads. Carlton U15 Next Generation Academy :Travis Abdule, Finn Andrew Frazer, Iggy Simm Finn & Iggy were selected to play in a match between the Carlton and Essendon NGA teams held at Ikon Park on Sat Dec 1st. It was a great afternoon and good experience to try and match pace and defensive pressure with a very quick and hungry Essendon on a hot day. I had the privilege of coaching the team with Brett Potter and thoroughly enjoyed the experience. Carlton Knights U15 Matthew Kreuzer Squad: Ben Little, Finn Andrew Frazer, Iggy Simm, Reg Dugan Oakleigh Chargers U15 Development Squad: Sully Everett Congratulations . Click the link to register for NJFC 2019 season. NJFC Sprint Technique Flyer For all the details please click on the link above. New lights – Only days until voting deadline!